The Shaman LV were the second pair of boots I bought, and my very first technical shoe. Designed predominantly by the man himself Chris Sharma, these are a female off shoot of the original Shamans. Great for boulder and overhang problems, I think they’re worth every penny. As you can see from the pictures, mine have been very used and are still very loved! Fit – So the ‘LV’ in the shoe name means low volume, not ‘lady version’ as I first thought. Although this does mean that they are better for people with narrow feet, and for this reason they are targeted at female climbers. However guys shouldn’t be put off by this because if it fits well, wear it. I’m a street size 3 (UK) and I size matched, which seems to be a common thing with Evolv climbing shoes. I did have to plastic bag my larger foot at first, (you generally have one foot larger than the other…or smaller depending on how you look at it) but after a couple of climbs the bag was no longer needed. I’m not going to lie they were pretty painful at first! I think this is because I sized to my smaller foot, however I feel that this was definitely the right thing to do because after a few weeks of breaking in they fit like a glove, and felt snug how a bouldering fit should. 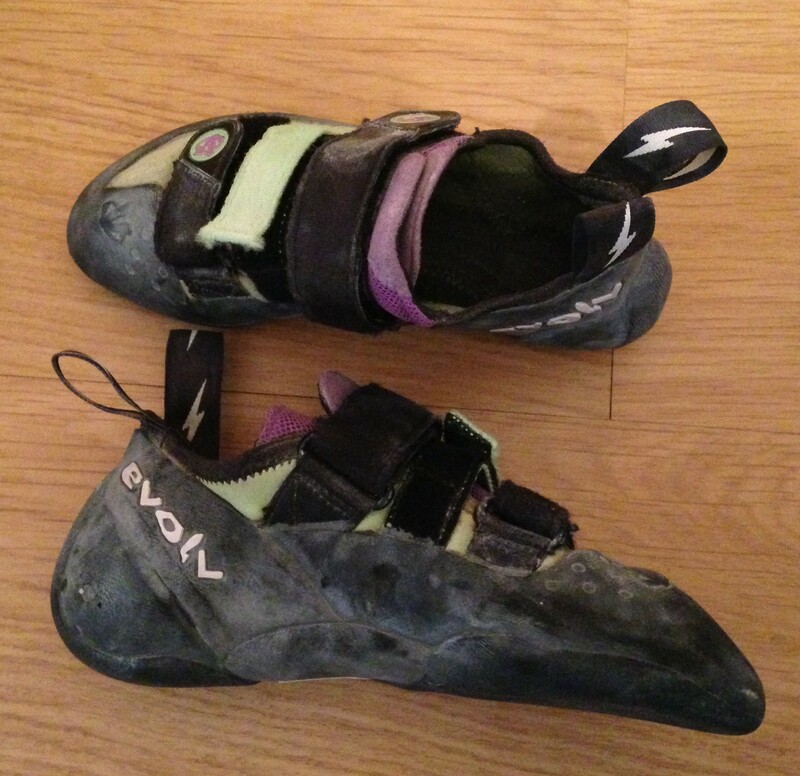 Specifications – This is a down turned asymmetric shoe which makes it particularly great for overhang climbs. One of the features of the Shaman is the ‘love bump’, which you can feel at the front of the shoe under your toes as it forces your foot into a claw position. Another feature is the ‘knuckle box’ which works alongside the bump by encasing your toes, the idea is to keep your foot in the most powerful position. It feels like there is no flex in the shoe because of the solid sole, but I’m finding that I prefer shoes like this as it offers more support to the foot. The 3 strap Velcro system is just like any other for the most part, it feels safe whilst still being easy to take the shoe off. Having the middle strap fastening in the opposite direction really helps keep the shoe tight on your foot, and is another excellent feature. Performance – The TRAX high friction rubber wears extremely well and stays grippy, which made me feel confident edging on sma ll holds. I feel like they’re on the heavier side for a climbing shoe, meaning they lack some sensitivity. However still being a newbie I enjoyed (and still do) the feeling that there’s something on the end of my leg, connecting me to the wall. On the whole I have no complaint about these boots performance wise, they did everything I asked and still kept the sizing and shape. The only downside is the smell. Despite having a cotton heel and leather footbeds I still had to use Boot Bananas in them, the microfibres uppers just do not breathe at all. Seriously, the smell stays with you. This doesn’t affect their performance of course, just possibly your relationships with friends/partner/pets. Aesthetic – Personally I am a fan of the mint green and soft lilac as it’s feminine but not overly girly. I’ve seen fellas wearing the female version because they preferred the fit and colour combo, as the male Shaman is orange and blue which is not everyone’s cup of tea. My partner has the male version of the shoe which actually came out first, and it does have a few differences. The male Shaman has a wider toe box, and I find the female version is more pointed and claw-like at the end. Both look on the chunkier side when they next to other climbing shoes, so if you’re after something more streamline in the looks department, these may not be for you. 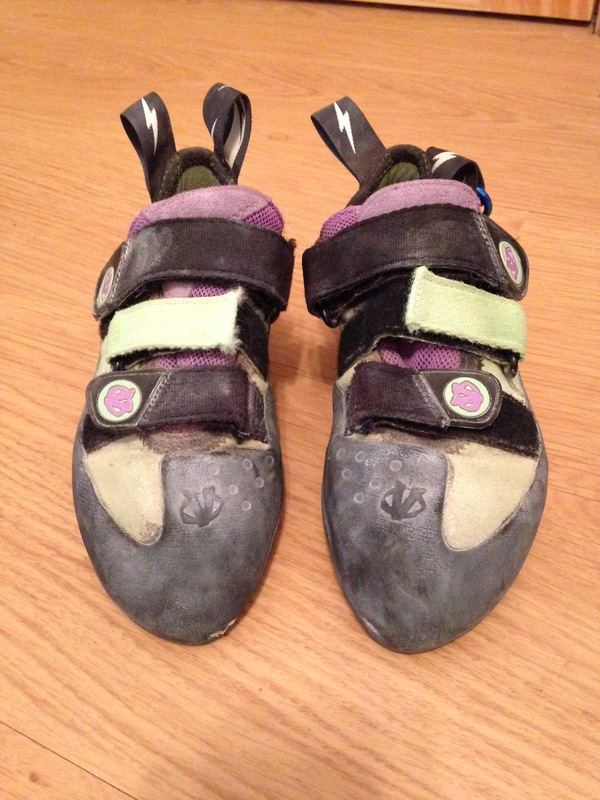 These boots have traveled to many different bouldering gyms and performed amazingly well each time. Even though the Shaman LV are marketed for slimmer feet, I think these are still great for ladies with wider feet like myself. They still fit snug and retain their shape after breaking in. Overall I would definitely recommend the Evolv Shaman to someone looking for their first technical shoe, as they’re great for building confidence and perform well on smaller edges. Thanks for the review! I just got my pair (in my normal shoe size) and they are so painful!! Since you said it does feel comfortable after the break-in period I’ll stick with it…i’ve never had an aggressive boot before so I guess this is a normal process.